If and when Apple releases a 7.x-inch iPad, what will they call it? What will appear on the keynote slide high above Phil Schiller at the introduction event? 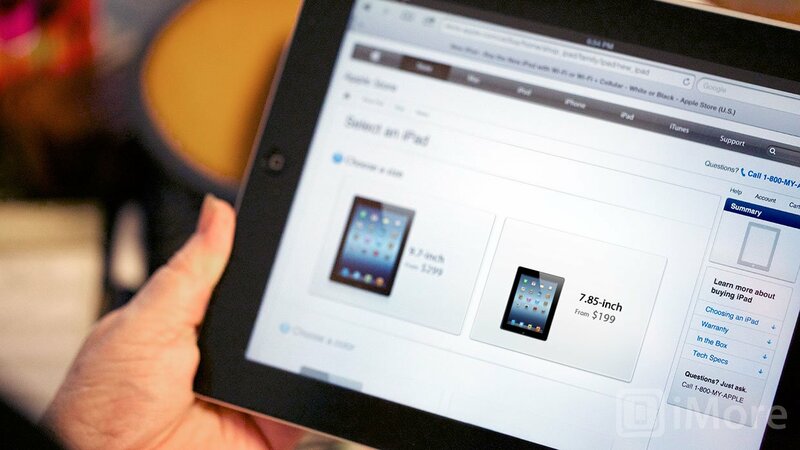 What will appear on Apple.com and, more importantly for shoppers, on Apple's online listings and retail store tables? Internally, for now, Apple might still be calling it "the 7-inch iPad" and be leaving the big branding decisions for closer to launch time. Or maybe they've already decided to call it an iPad mini or something else. Either way, whatever name they choose will influence how the public understand the new device and its place in Apple's lineup, and that's an interesting topic to explore. We've already covered why Apple would release a 7-inch iPad, how Apple could implement the iPad mini interface, and how Apple could handle the iPad mini display -- Retina or not. Now let's take a look at what that smaller iPad could be called. Originally there was the iPhone. As Apple expanded the iOS family of products, they added new brands to round out the line -- iPhone, iPod touch, iPad. Apple could do something similar with the 7-inch iPad -- give it an entirely new brand name. iBook has already been taken by the eReader software and service, but Apple could come up with something else for the smaller-screen tablet. Individual SKUs could then be further categorized by color, storage size, and Wi-Fi vs. Wi-Fi + 4G. It seems unlikely Apple would further complicate the product mix for a device for which size alone is the only major differentiator. Originally there was the iPod. As Apple expanded the iPod family of products, they kept the iPod brand but added sub-brands to the mix -- iPod shuffle, iPod nano (replaced iPod mini), iPod classic, and iPod touch. Apple could do something similar with the iPad -- iPad and iPad mini. Individual SKUs could be further categorized by color, storage size, and Wi-Fi vs. Wi-Fi + 4G. This branding is simple, clean, and fits with Apple's past (iPod mini) and current (Mac mini) brands. When Apple introduced the third generation, redesigned MacBook Air, they added a smaller model to the product family. What they didn't do was add another new brand, or sub-brand. There was no MacBook mini or MacBook Air nano. Apple could do something similar with the iPad -- 7.85-inch iPad and 9.7-inch iPad. Individual SKUs would still be further categorized by color, storage size, and Wi-Fi vs. Wi-Fi + 4G. This is superficially simpler, as there remains only one iPad brand, but not as obvious, as inch-measures require more thought than abstractions like "mini" and "not" mini. Since the MacBook Air is already a sub-brand (of MacBook, alongside MacBook Pro), going with measures keeps the brand from extending out absurdly, the way a Microsoft brand might. Since the iPad isn't a sub-brand of anything (there's no public iOS device super-brand sitting on top of it), going with measures isn't necessary here. [Update: This section was added after John Gruber of Daring Fireball proposed the idea of an "iPad air". When Apple introduced their first new laptop in years, they didn't call it a MacBook mini. They called it a MacBook Air. Originally there was MacBook, MaBook Pro as well. Apple no longer sells the plain MacBook anymore, so now there's just MacBook Pro and MacBook Air. Air was and is aspirational and symbolic branding. It focused on the thinness and lightness of the new laptop. And that just might be what Apple wants to focus on with the new, thinner, lighter iPad. iPad Air could do that. Apple almost certainly won't go this route. Samsung's original tablet was the Galaxy Tab. When they added larger models, they incorporated the actual screen size measures into the brand names -- Galaxy Tab 10.1, Galaxy Tab 7.7, Galaxy Tab 7.0 Plus (?! ), Galaxy Tab 8.9. When Samsung added new generations of hardware, they added the generation number in as well -- GalaxyTab 2 10.1, Galaxy Tab 2 7.0. While Apple uses screen size measures in stores and on product information pages -- 21.5-inch iMac, 27-inch iMac, they don't use them as part of the public facing brand. An iPad 7.85 wouldn't make it into an Apple keynote. Apple's branding is typically as succinct as Occam's Razor. Earlier this year, they took it a step further and rebranded what would have been the iPad 3 as simply the (new) iPad. While we probably won't see Phil Schiller on stage beneath a slide reading "the small iPad", we probably will see him beneath one reading the 7-inch iPad, or the iPad mini.